Some many months ago, a fan of idol group Rev. from DVL uploaded the photos of one of the members during their performances. That photo shot the girl to fame and all of a sudden, she starts appearing on TV, Popteen magazine cover page, and even became Karaoke DAM channel’s 11th generation emcee. Probably also thanks to her, Rev. from DVL’s CDs are also being introduced at Karaoke bars now. It was this picture that got many people online asking who she is, and commenting about how “too angelic” she looks. As with the exaggerating entertainment industry, she was dubbed “the exceptional talent that appears once every 1000 years.” But this goes to show that dreams can come true in Japan’s entertainment industry. Much like how vocal disaster 剛力彩芽 (Goriki Ayame) can appear on Music Station, how ももいろクローバーZ (Momoiro Clover Z) can sell enough to get on The Annual Red-White Songfest, and how 高橋みなみ (Takahashi Minami), current general superintendent of all the AKB franchise groups, can get into AKB48 simply because 1) she’s 148cm tall and 2) her birthday is on April 8th (4/8). Rev. from DVL is from Fukuoka so it is little wonder you get prettier girls in the groups since Fukuoka women are known to be beautiful. If you take an overall look at the entire AKB franchise, you may realise that on the whole, HKT48 has a higher rate of cute girls than the rest (this comparison does not include 乃木坂46 which I think tops the looks department among them). 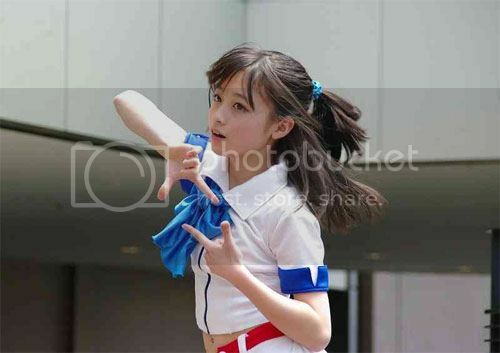 If you’re interested to look this girl up, her name is 橋本環奈 (Hashimoto Kanna). And no, DVL does not mean Domestic Violence Love. It means Dance Vocal Love. Sounds very Japanese I would say — just throw a couple of English vocabulary in there and BAM! There’s your group name! I guess good looks are everything in the entertainment industry…. Haha. I don’t particularly think Momoiro Clover Z has anything to show for in the looks department, but it seems that they’ve got great attitude so, I guess it’s the dynamics as well? As long as something about you sells, it doesn’t seem to matter if it isn’t what you do for a living. Didn’t know you know so much about idols haha. she’s very very cute, but many also said that this is a miraculous shot but i still think she’s damn cute. I don’t really know too much but I actually do a little bit of research at times before I post things. I do think she’s cute too although I do agree that this shot is an overwhelmingly good shot. In other pictures, she looks just normal cute.